A brief analysis of secondary market sales channels for selling wine in Australia for private individuals or business charged with the disposal of assets. Finding where to sell your wine can be a tricky proposition. There are a number of options (online and otherwise) and each have their positives and negatives. When it comes time for you to sell your wine, you want to ensure you get the best price in the right time frame. If you have rare and valuable wines to sell then you need to ensure you entrust it to the right place, one that will give you a true but realistic valuation (nobody likes their time wasted) and who will have a ready congregation of eager wine enthusiasts and wine lovers willing to make an offer on it. How do I sell my wine online? Choose from various private, retail and auction options below for one that best suits you and your wine. Remember, a bottle valued at $99 needs to find at least one buyer who is happy to be paying $99+ for a bottle of wine; its no use chasing 100 buyers who only want to pay $9 ! Send a list of your wine to be valued. You will then normally be sent an offer and a list of reserves. Most places will suggest reserves within 10% of each other, anything too high or low should be queried. If you choose to accept, they will either arrange to pick up your wine or you can drop it off to them. Once it is sold you will get paid, minus any commission that was agreed on. Where can I sell my wine? There are a number of channels open to you for selling wines. It is important to understand how the buyers perceive these sales channels as well. Private. The best option if you want to see your prized collection go a good home and you have the time to offer after sales support (so to speak). Beware of how you announce your intentions as most social media sites have very strict rules about selling or promoting alcohol on them, and you may also attract the attention of the authorities and the tax man. Retail. Some corner bottle shops may take your wine on consignment and sell it in their shop. Just keep in mind that their specialty and market is to sell current release wine and your bottle may languish on the shelf for some time before it sells and can cost you as much as 40% commission. Also enquire where they will display your wine, you don't want it sitting on a warm shelf for months on end. EBay and other self service auctions. Because you are selling direct to the consumer you require a liquor licence or you will find your listing removed and/or it will be reported to the authorities. You cannot "borrow" or use another persons liquor licence either, the penalties for which can be the loss of that persons licence and even criminal prosecution. Wine storage facilities. Some wine storage facilities offer to sell your wine while you store it with them. The prices that are suggested are usually significantly higher than secondary market prices which can make it hard to find a buyer in the short term and often leaves your wine sitting in a managed facility for far longer than you may be comfortable with while you continue to pay storage, insurance and handling fees. 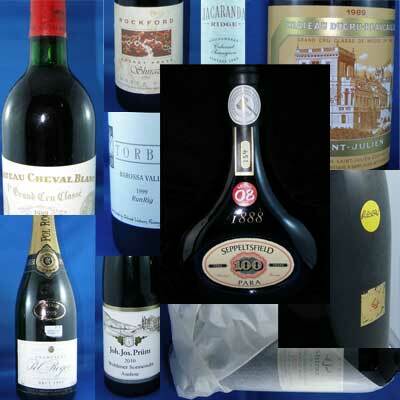 Wine Auctions are your best option if you have good quality wine of any quantity to sell. In Australia, there are only a few traditional, wine-only, auction houses, such as Wickman’s, whose only business is to sell wine through auction. General auctioneers may not completely understand the worth of your wine and typically draw only from a pool of buyers who are looking for inexpensive, current release wines. Location: Unless you live right next door to an auction house, physical location is less of an issue than it used to be as most auction houses will cover most, if not all of any shipping costs to get your wine to auction. In fact Wickman’s will offer to come to where the wine is stored and do the packing and logistics of sending large wine collections to auction for you. Membership fees: There should not be a membership charge for sellers and a membership fee can restrict the pool of buyers who may be interested in bidding on your wine. Wickmans do not not charge a membership fee. Auction type: There are a few unusual auction styles that have been introduced recently that may or may not suit your wine selling goals. Standard ‘English’ style auctions are best for high quality wines, especially if the price is uncertain or changes over time. Reverse auctions - ‘Dutch’ - are typically meant for selling distressed stock at the cheapest possible prices and work in favour of the buyer and not the seller. Wickman’s uses the traditional ‘English’ method and work equally hard for both parties to establish a fair price where everybody has a happy payoff. Commissions: Typically charged as a percentage only when the goods have been sold. Seller’s commissions can be negotiated and can vary from 0% through to 25% depending on the type of wines and the quantity for sale. Wickman’s has always offered the lowest commissions in Australia. Storage: Make sure your wine is being stored in professional, temperature controlled conditions, a warehouse with a struggling air conditioner doesn’t really cut the grade these days. Provenance grading: If you know where you purchased your wine and how it has been stored in the interim, then let the auctioneer know your wines history. Properly stored wine with good documentation can add as much as 15% to the final price achieved. Ensure your auctioneer is set up to take advantage of good provenance by making the buyers aware. Wickman’s offer a YouTube channel and social media outlets that enhances a buyer’s perception of the wine on sale and has increased the result for wine sellers by as much as 25%. How is wine valued on the secondary market? The true market price is determined by the buyer and not the seller, unless the item in question is rare and desired by multiple buyers. Typically we use a database of recent sales figures based on significant volume and from multiple buyers at auction around Australia to determine current value. Because retailers specialise in recent release wines rather than aged and uncommon wines, the retail prices for secondary market wines are highly exaggerated and rarely based on any realistic volume of recent sales. Most wines typically fall in value by as much as 40% as soon as you pay for it. The amount it falls depends on the marketing hype surrounding the wine, how good the wine actually is and how well that quality is known amongst the wine drinking community. A winery can only guess what the wine is worth when it is first released and it is usually a marketing decision that sets the final price you pay in the bottle shop or cellar door. Then over time, as the wine circulates and is opened, the wines reputation is solidified through wine shows, tasting panels, wine reviewers and, more and more importantly, through social media chatter. The subsequent price being demanded for the wine then becomes a matter to settle on the open market via traditional auctions. Good vintages, in the least tend to hold their initial release price even as the current release price rises with annual inflation. Very good vintages tend to bubble up to the current release price as it changes over time and exceptional vintages sometimes tend to exceed even the current release price. If you want to find out the current prices being paid for Penfolds Grange. If you would like Wickman’s to value your wine at no cost, please send an email with your list of wine including vintages (Further information about Wickmans selling your wines). Do I need a liquor licence to sell wine? Only if you intend to sell the wine through eBay or another type of self service facility, otherwise you can sell it through an auction house or retailer who will act on your behalf as your agent. Are reverse auctions good for selling wine? Reverse auctions favour the buyer rather than the seller and have traditionally been used to move distressed or excess stock at the cheapest possible price with sellers, not buyers, competing against each other. What wines are worth more than cellar door price? Rockford (Basket press and SVS shiraz in good vintages only). Noon Winery (Reserve Cabernet and Reserve Shiraz – any vintage). Greenock Creek Shiraz (Alice and Apricot block Shiraz in great vintages only). Wendouree (Shiraz only – any vintage). What is provenance and how does it affect the price I get at auction? Many buyers are wary of buying secondary market wine as they don’t know where it has been. Since adverse storage conditions can affect the quality of the wine, buyers like to know the history of where is has been purchased and stored. The greater the level of buyer comfort about how well you have looked after your wine, then the higher a buyer will value your wine against wines of unknown origin. Wickman's offer a guaranteed provenance system for qualifying sellers. Whilst there has not been any conclusive evidence put forward that good quality wine sells better at any particular time of year, logic suggests that selling prior to Christmas and other festivals or occasions may yield slightly better volume returns. Also, significant birthday vintages may cause prices to temporarily rocket up in price. Are there any places that will purchase my entire wine collection? Wickman’s can find a buyer that would be willing to take your entire collection in one transaction but those sort of buyers typically want to take large discounts of around 25% - 40% less than reserve. Many wineries have a stigma about their older vintages appearing for sale on the auction market. Actually, its an excellent way to promote a brand and maintain a reputation over the years. When a wine is out of circulation for many years and it is not talked about through the wine drinking community then its value falls at auction which in turn can reflect on current release price. The larger companies understand this as a viable marketing strategy for their brand and ensure that past vintages are always available (in minute quantities) for circulation through the wine community via auctions. If you would like to place your wine at auction, please send an email asking for a no obligation, free valuation of your wine. See the following page for more information about selling your wines at auction.